Brockton, MA (July 10, 2018) – A 25 year old father died Monday night when his motorcycle collided with another vehicle in Brockton. Brockton police say that Devin Delacth of Brockton was riding his Suzuki Motorcycle on North Main, near Davidson Street around 9:40 pm Monday. He then collided with a Volkswagen hatchback and was ejected from his motorcycle. 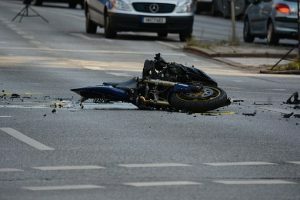 A passerby noticed Delacth lying face down in the roadway with motorcycle pieces strewn about the road. She performed CPR on the injured man before paramedics arrived on scene. Delacth was rushed to Good Samaritan Hospital where he was pronounced dead from his injuries. The hatchback driver was uninjured and remained on scene to cooperate with the police investigation. It is not immediately clear what caused the crash to occur. Local community members described Delacth as a caring person and a loving father to a young child. His girlfriend, Ashley Mendes, said she considered him her soulmate and the glue of their family and that he will always be loved and missed. The crash remains under investigation. No charges were immediately filed in the aftermath of the accident on Monday night. We are extremely saddened to hear about the sudden loss of Devin Delacth. Our thoughts and deepest condolences are extended to his family during this difficult time. We understand the struggles that loved ones experience in the immediate time following the loss of a family member in a crash.